Over the past few months I've been anxiously awaiting the new PS3 title Tokitowa. While some are looking forward to the love story aspect or to its attempt to make a playable anime, the core of my anticipation is something altogether different: I've been dying to play another Japanese time travel story. For me, time travel is the perfect narrative setting. It can be used as a backdrop for any other type of story: mystery, action, romance, or even a magical girl anime. And when it comes to the exploration of time travel as a concept—and the sheer fun of a time travel adventure—there are few places better to look than Japanese games. Many Japanese games have time travel as an element—Earthbound, Tales of Phantasia, even the original Final Fantasy—but today I want to highlight some of the best games centered around time travel. So click through the gallery above to learn a little about each. As far as time travel games go—Japanese or not—none is better than Chrono Trigger. Starting as the story of some kids in a post-industrial revolution world, it quickly becomes a mission to save the planet from destruction by an eldritch abomination (nearly a thousand years in the future). Traveling from distant past to post-apocalyptic future, you gain a wide array of characters—including a cursed knight, a caveman, a dark mage, and a robot. But far from just an adventure, it deals with the themes of fate, death, life, and the unexpected consequences of even the best of intentions. 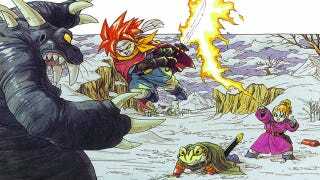 As far as game stories go, Chrono Trigger might be the pinnacle. And thanks to the enhanced Nintendo DS version of the game, it still holds up more than fifteen years after its original SNES debut. 2010's Radiant Historia isn't Chrono Trigger, but it is the next best thing. The world is on the edge of collapse with the two major nations at war and a mysterious, ever growing desert ravaging the lands. You take on the role of an intelligence operative who, after dying on a mission, is granted the ability to time travel by two child-like beings. Not content with a "simple" time travel story, the plot of Radiant Historia spreads across two different timelines as well: Information and items you gather in one are often the key to solving a problem in the other. So in addition to seeing the effects of changing the past in each timeline, you also watch the world unfold in two completely different ways, never sure which is the true "final" timeline. Originally conceived as a side story, Legend of Zelda: Majora's Mask takes a look at a different type of time travel story: a time loop. When the titular mask caused the moon to fall and the world to be destroyed, Link uses the Ocerina of Time to travel three days into the past to try to prevent the moon's fall. Of course, in practice this isn't possible; so you will be forced to loop again and again, defeating monsters, conquering dungeons, and gathering magical masks in preparation for your battle to break the loop. Personally, I became obsessed with trying to get the "perfect" three-day time span, doing all the dungeons and side quests over the course of one loop. And I was able to do it—if I ignored the old woman that forces you to waste all of your nights listening to her talk. The PS2's Ephemeral Fantasia is a time loop a lot like Majora's mask, but the kiddy gloves taken off. In this game, you are dumped into the world and given little to no information on what to do or how to do it—and if you like that kind of exploration, then this is the game for you. With your magical talking guitar (because at this point why not), you recruit party members by witnessing specific events at specific times and try to unravel the mystery of why these six days before a wedding keep repeating themselves. Ghost Trick, by the creators of the Ace Attorney series, is a time travel mystery. At the start of the game you wake up dead and amnesic to boot. However, as a ghost you find you can jump from inanimate object to inanimate object and move small objects as well. Moreover, if you enter the bodies of the recently deceased, you can travel back to a minute before their untimely deaths and hopefully save them. But why are you dead? Who killed you? And can you solve the mystery when you don't even have a body? These are the driving questions behind Ghost Trick. More than that, though, Ghost Trick has Missile.